I never heard of it before but I know I could use it! I am always looking for tools, especially smaller ones for my sons toys and electronics..this would be perfect for those jobs. I’ve never heard of it, but I like the fact that it has all those tools in one handy tool. All of the tools included are ones that I could definitely use in my home. Ive never heard of the tool prior; but it sounds like it would be very useful for anyone to have on hand! I had not heard of this tool before…having a built in Level and built in Tape Measure are two items I would use often. I think this looks like such a great tool. I think everyone could use one of these, but none more than my husband. He is an outdoorsman, and a farmer. He would love this. I had not heard of it before this post. I think it looks like an extremely useful tool to have around. No I haven’t heard about it before. Now that I have, I want one!! Cool item. Never knew about this. I haven’t heard of the Kelvin Multi-tool until this post. What a great concept! I could definitely use this around the house! No, I have not heard of the Kelvin Multi-Tool prior to today. I think it looks like it would be a really handy tool to have around the house. I was out of luck the other day when I went looking for a level. This would have been a lifesaver that day! That would have come in handy, I was surprised it had a level in it. Good luck, have a great day! I’ve seen (and used!) multi-tools before, but not this particular one. I like that it has a level built-in. I had never seen or heard of this product before today and I love that the tool even has a level on it!!! I never heard of them but sounds like a great tool to have around. No I had never heard of it. I think it is one of the handiest multi tools I’ve seen! I have never heard of this tool before, but it looks like it would be a very hand tool to have. This is my first time hearing of it. I have not heard of the Kelvin Multi-tool before today. I think it looks amazing. A great multipurpose tool that has so many different options. Love it. 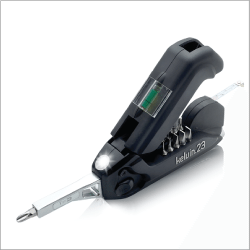 Before today i’d never heard of the Kelvin Multi-Tool. I think it’d be a nice tool for just about anything, to keep around the house, to have in your car if you need it or to use when doing DIY or craft projects. I think it would also make a nice gift. I have never heard of it, but my husband loves gadgets! I’ve never heard of the Kelvin Multi-Tool prior to today. It seems like a very versatile gadget.